Winrock International promotes access to safe education by improving children’s physical safety and emotional well-being, and fostering an enabling environment in which children can thrive. This means helping communities and schools create safe, supportive spaces for girls and boys alike; empowering families and communities to monitor children’s safety; and improving families’ livelihoods so they are more likely to keep their kids in school. As part of the 16 Days of Activism Against Gender-Based Violence Campaign, Winrock International is highlighting its programs that bring attention to this year’s theme, “From Peace in the Home to Peace in the World: Make Education Safe for All!” The 16 Days Campaign begins on International Day for the Elimination of Violence Against Women (November 25) and ends on International Human Rights Day (December 10) and emphasizes that gender-based violence in its many forms is a human rights violation. More information here. For more than two decades, Winrock has been a leader in creating educational opportunities for children and youth, especially girls and boys at the margins of society. Our programs offer a variety of support — scholarships, mentoring, life skills training, literacy and numeracy training, community support, and policy advocacy. Where children and youth are out of school, we work on multiple levels to ensure that children can be safely withdrawn from child labor, human trafficking, commercial sexual exploitation, and other forms of abuse. 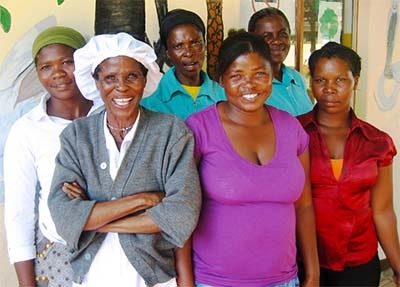 For example, Winrock’s Raising Family Income and Supporting Education (RISE) program empowers women and promotes education by pairing business training, loans, and grants for mothers with educational support for primary school students. The premise for these programs is simple: in exchange for receiving a business loan or grant, mothers must keep their children in school. In Côte D’Ivoire, Ghana and Tanzania, a study on the effectiveness of RISE showed that 98.8 percent of children who had been beneficiaries of the program in the three countries had completed or were still enrolled in school, compared to 82.1 percent of children who weren’t in the program. Women explained that the program contributed to their ability to keep children in school, as did awareness-raising activities on the importance of education. At the community level, Winrock helps create and support watchdog groups such as Child Labor Monitoring Committees (CLMCs), which report on the withdrawal of children from child labor, while monitoring them to ensure they stay in school. These groups also provide mentoring support to children and lead awareness-raising activities in their communities, particularly regarding the worst forms of child labor and the importance of education. In Cambodia, Winrock’s U.S. Department of Labor-funded CHES program established or strengthened CLMCs in 160 villages to monitor children at risk or engaged in child labor. 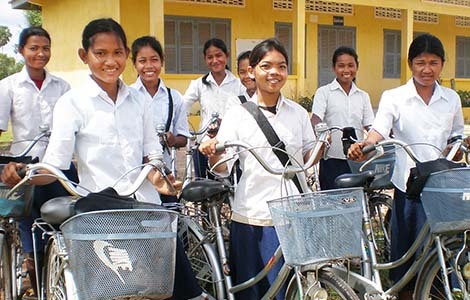 The target group included girls aged 12-14, the transition period from primary to secondary school, when girls are particularly vulnerable to dropping out and migrating to work in garment factories in Phnom Penh. There they face unpleasant or abusive working conditions and – if fired or laid off – are at risk of being trafficked for commercial sexual exploitation. At the national level, Winrock provides support to governments to pass laws and strengthen policies that criminalize actions that are abusive to children and negatively affect their ability to access education. When we began implementing our USAID-funded anti-trafficking program in Bangladesh in 2008, the national law against human trafficking only included women and girls, even though boys and young men were also being kept from school and trafficked for bonded labor, organized begging, farm and factory work, and commercial sexual exploitation. Winrock helped shape a new, more inclusive anti-trafficking law in 2011, and led the drafting of two subsequent National Plans of Action, which set concrete objectives, timelines, and roles and responsibilities to implement the law. Through these high-level policy changes, children and youth in Bangladesh now have a legal framework of protection, mechanisms to prosecute their traffickers, and access to resources that they can use to complete their education. 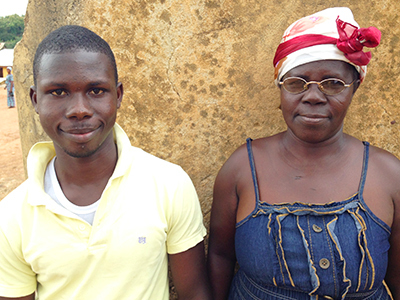 Read more from Côte d’Ivoire in the first blog from this series of three. Read more from South Sudan in the second blog. The tension between environmental and economic priorities has existed since the very first environmental concern was raised, and is one of the key issues at the heart of international and domestic climate policy. Reducing emissions and adapting to inevitable climate change has global and local benefits, but will also take time and cost significant amounts of money. The cost for Africa to adapt to a global warming of 2°C is estimated to be $5-10 billion per year. If this 2°C target is not met — and current emission reduction pledges fall short of this target — the cost will be much higher. The cost of halving deforestation globally has been estimated to be between $15 and 35 billion per year, and this is considered one of the more cost-effective sectors. What are the costs and benefits to decarbonize an economy? How much should industrialized countries pay for other countries to develop more sustainably? How should money be raised and disbursed? How is the private sector engaged? These questions and more have been embedded in U.N. climate negotiations for over 20 years, and the current round of negotiations in Paris are no different. The 1992 U.N. Framework Convention on Climate Change recognized that industrialized countries should provide financial and technological assistance to help developing countries reduce emissions and develop sustainably. This led to the creation of the government-funded Global Environment Facility to help channel funding, although it never reached the required scale. The 1997 Kyoto Protocol created an emissions trading system to help reduce the cost of mitigation, engage the private sector, and help finance low emission projects in developing countries. International emissions trading took off when a regional market was established in Europe that recognized offsets generated in developing countries. It subsequently crashed when the E.U. market had too many permits and cut off the eligibility of many international offsets. The early boom years of the carbon market proved the power of market mechanisms to raise finance and reduce emissions — if the market policy is set correctly. Many other states and countries around the world have since established emissions trading markets, including China, Chile, Mexico and, in the U.S., California — where Winrock’s American Carbon Registry has captured over 50 percent of the market. Markets, however, are not the only arrow in the financial quiver. The number of funds and financial mechanisms created to help pay for mitigation and adaptation are almost as common as French patisseries in Paris. Funds have grown and shrunk over the years, with new approaches coming into vogue as older ideas and governance models fade away. The latest and largest climate fund is the Green Climate Fund, which has over $10 billion in pledged funds. 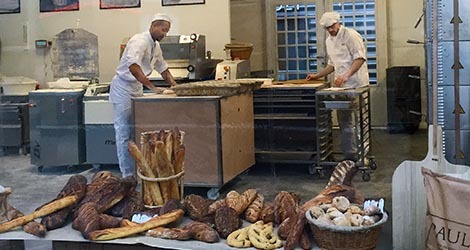 In true French style, the Paris negotiations has its own bakery and patisserie to serve delegates tasty French breads and pastries. In true COP style, numerous countries, multilateral development banks and private companies are all announcing new funding pledges — equally as appealing, albeit with slightly less butter and, hopefully, not so flaky. Germany, Norway and the U.K. have pledged an extra $5 billion between now and 2020 to pay for emission reductions from reduced forest loss (some of which may go through the Green Climate Fund). France committed to investing 2 billion Euros in renewable energy in Africa between 2016 and 2020, a doubling of its current investment. The World Bank announced a new plan that calls for $16 billion in funding to help African people and countries adapt to climate change and build up the continent’s resilience to climate shocks. 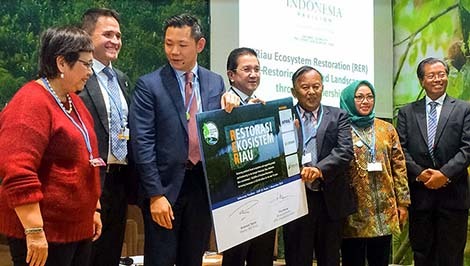 APRIL — a large Asian pulp and paper company — announced it will invest $100 million over 10 years to restore 400,000 hectares of degraded peatland forest in Riau, Indonesia. The list could go on and on. While these pledges are needed and will help close the financial gap, long term financial solutions need to be set in motion as part of the new agreement that is meant to be agreed upon in Paris. A number of countries have said they want to use market mechanisms, while others oppose it. Detailed rules will not be settled over the next week — at most an international framework will be put in place with the promise of finalizing the details in coming years. Hand in hand with an international agreement, domestic policies also need to re-examined in all countries to help create a policy environment that encourages sustainable, low-emission development. Winrock is helping a number of countries access international finance – particularly for reducing emissions from deforestation and forest degradation. We work to develop national monitoring and accounting systems that countries can use to access payments for reducing emissions. 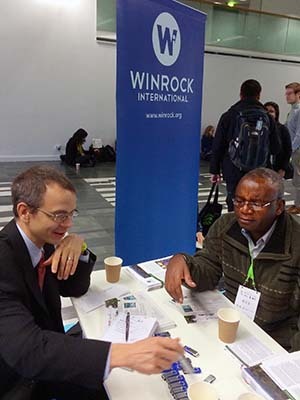 Winrock also works on low emission development strategies and initiatives in many countries, including domestic policy options to finance low emission development. Paris is the City of Light, and of love. And of a dozen TV shows in prime time where panelists argue about books. Seriously — a dozen. Paris just faced one of its most momentous challenges to French culture and values in the coordinated attacks on cafes and a soccer stadium and a concert hall. Now it is under assault again — by 40,000 delegates from 195 countries — which include not only country leaders and diplomats, but representatives from advocacy groups, the private sector and analytic experts all attempting to find just barely enough common ground to fill, say, 20 pages of agreed-upon framework text. Everyone seems to feel that politically, this could be the best, maybe last near-term opportunity to achieve consensus on an overarching climate agreement that could slow the rate of greenhouse emissions into the atmosphere. Getting 200 countries to agree on anything is a really big deal. It’s pewter gray yet again today, Thursday, with rolling columns of cumulous clouds sweeping serenely by the Eiffel Tower out my hotel window. The flight over featured many climate change negotiators, experts, and NGO advocates trying to sleep and get organized for a huge policy event – the annual Conference of the Parties (COP) to the Framework Convention on Climate Change (UNFCCC). This moment is now almost 25 years in the making counting back to the start of the 1992 climate negotiations in Rio de Janeiro. My seatmate on the flight over was a rep from the American Petroleum Institute, who is attending for the first time, and who didn’t quite seem to grasp what the event is all about (this is my 12th since the late 1990s). This is excusable, since a COP is a cross between an operatic Italian circus (Wow! Bam! Are you kiddin’ me? ), a Fuller Brush salesmen’s convention (endless snooze), and a deadly serious United Nations negotiation on a Big Issue of Supreme Import — climate change. Everyone hopes only for a framework agreement — the big picture global deal on only a few topics. To simplify, the key issues are: who has commitments to reduce emissions? (Now every country. ); how will countries define their contributions to emissions reductions? (Basically, by proposing a set of activities and seeking funding for them. ); how much funding will be made available to less-prosperous countries in the southern hemisphere by wealthier nations in the north? ; how will voluntary pledges be measured and monitored? ; and how will the need to address the impacts of climate change on developing countries (like sea level rise) be addressed and funded? If an agreement is reached here, there will be, probably, three to five years of consolidating details as the difficult, intertwined decisions of how to operationalize whatever is agreed-upon is hammered out — like a brass cauldron in the metal alloy of old Paris. A real challenge is knowing roughly what’s going on in the big game at the COP negotiations proper. There are about four games going on at any COP. First, the formal U.N.-style negotiations in vast rooms with thousands of credentialed delegates from the 195 represented countries. The rooms are filled with long tables of delegations arranged alphabetically and monitoring the translations of the proceedings in any of the five officially designated U.N. languages. These meetings generally follow a formal, decorous U.N.-speak-laden diplomatic process, where the leader of a delegation, flag raised, waits for a turn to speak briefly, if not on the agenda. The meeting areas, press rooms, food courts and hallways surrounding the major meeting rooms are swarming with thousands of delegates not in the rooms and needing to chat or hash out an issue in private. Meanwhile, NGO experts and advocates wait to hear what went on in the key rooms and to lobby delegates and environmental advocates while media hover about, trying to figure out the storyline of a complex, organic process. 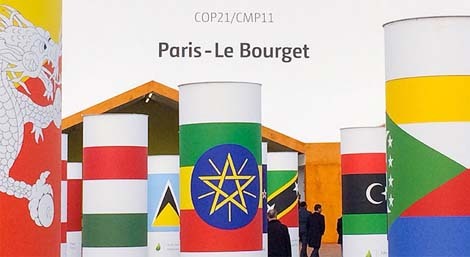 Second, there are the formal COP-area “side events,” where a country or group of experts or institutes have applied and been accepted by the UNFCCC to present their views in smaller venues. Third are the less formal side events outside of the main COP venue which proliferate wherever someone has cleverly found a location with drinks and enough room to attract a crowd. These include dinners, press events releasing a new report’s findings, or celebrating how well — or poorly — the last year went from a given viewpoint. As usual for a COP, some big announcements have been made by major countries. On the opening day Norway, Germany and the U.K. pledged $1 billion per year for five years up to 2020 —5 billion dollars — as a commitment to get the global system of performance-based payments for reducing deforestation and forest degradation and tree planting (called REDD+ in COP-speak) in tropical countries. Winrock’s Environment Group (FNRM and ECO) has several major AID projects, as well as a half dozen or more shorter method development and assistance projects (mostly with World Bank funds), underway supporting REDD+ countries. The U.S. pledged $248 million in new assistance on climate change, which appears to be largely focused on the energy sector. But the real work is working with developing countries to provide assistance of all kinds so that they can fully participate in the process, in the financial and technical mechanisms that have emerged from the UNFCCC over the years (e.g., the Clean development Mechanism — which drove Winrock’s and many others’ work creating pilot projects, methods etc. — indirectly spawning Winrock’s American Carbon Registry, which at the domestic, state level records emissions-reductions trades from such projects in the California market). Many countries have formally submitted their proposed contributions to reduce emissions starting in 2020. These “INDCs” (Are you ready? This means “Intended Nationally Determined Contributions” in COP-speak…) are very crude proposals on how they would reform their energy, agriculture, forest, transport and other sectors. These are probably going to be the first-order game plans for everyone supporting them — including Winrock — to try to figure out how to help, what needs to be done, how much it would cost, and how many metric tonnes of emissions reductions the activities would generate if funded and implemented. Figuring out how to implement them is the crux of the matter. The Winrock delegation — Bob O’Sullivan of ENV Group, Brian Bean the Chief of Party for the FNRM LEAF project in Southeast Asia, and I — are primarily focused on speaking on or organizing panels in side events to share early lessons learned; gauging the level of interest in supporting potential activities by the range of donors here; and brainstorming with developing countries on what they need, to find the next set of major activities for us over the years ahead. When wars end and nations begin to rebuild, children are often faced with a battle on another front – the effects of conflict on their safety and education. The trauma of insecurity and displacement can have a severe impact on children’s ability to learn and cope with the demands of the classroom. This is particularly true for girls and children with disabilities. They feel unsafe traveling to and from school, facing harassment and a dangerous learning environment. Many children have been out of school so long they have difficulty concentrating, and struggle to keep up with the pace of their studies. This is what we’re learning about the children of the world’s newest nation. Winrock International is working to provide more than 800,000 children in South Sudan with access to safe education. Through the USAID-funded Room to Learn project, we have established community advocacy groups to support and mentor girls, and help them achieve their full potential. We are working with our partner organizations to address the high gender disparity in South Sudan’s education system by forming Gender and Social Inclusion advocacy groups. These groups raise awareness of the social and cultural challenges girls and other marginalized people face in trying to get an education. Winrock is also developing a mentoring program for girls, as part of the Girls Education South Sudan (GESS) project, led by Mott MacDonald and funded by the Department for International Development (DFID). Through teacher-led mentoring sessions, the program creates a safe space for girls to talk about the challenges they face. The program builds their self-esteem and resilience by reinforcing the development of positive self-identity. Our hope is that girls will develop a sense of belonging, so they are able to trust themselves and others, and have hope for the future. Winrock has long been a champion of girls’ education and mentoring. We provided scholarships to more than 150,000 children in Sub-Saharan Africa under the Africa Education Initiative-Ambassadors Girls Scholarship Program, funded by USAID (2004-2011). Winrock also helped develop the USAID Girls’ Mentoring Resource Guide, used by volunteer mentors in Africa to nurture children’s emotional well-being, teach life skills and improve their school readiness. Our work in South Sudan builds on these efforts. Education has the power to change the trajectory of children’s lives in conflict-affected countries. We’re working to create the conditions that will make their learning safe and successful. Read more about our global work in the third blog.